LONDON, Ohio – A new field drainage technology could help reduce runoff from farm fields and reduce the risk of harmful algae blooms in Lake Erie and other Ohio lakes. The system, called an Inline Water Level Control Structure, is designed to keep water and nutrients such as nitrates and phosphorus on the land where they can be used by crops, Ohio State University’s Farm Science Review organizers said. Working with the Ohio Land Improvement Contractors Association (OLICA), two new water control structures were installed at the Molly Caren Agricultural Center during Farm Science Review last week. The new installations bring the total number of the systems in use there to eight, said Matt Sullivan, Farm Science Review assistant manager. He said the Molly Caren site serves as a model for drainage technology. The new control structures are part of the site’s comprehensive water management plan. “We call them nutrients in the fields, but it’s called pollution when it’s in the stream,” Sullivan said. “Farmers want to stay on the nutrient side. In this system, several drainage lines are installed throughout the field, leading into one main line that is connected to the water level control structure. Inside the structure is a series of stop logs or boards that, when placed on top of each other, create an underground dam that allows the user to control the height of water that remains in the soil, he said. “The water builds up into the soil, which acts like a reservoir so the crops can use the water when they are growing,” Sullivan said. “If nitrogen is in the water, the plants can use it like a reservoir of nutrients. The structure can cost $1,000 to $2,000, he said. 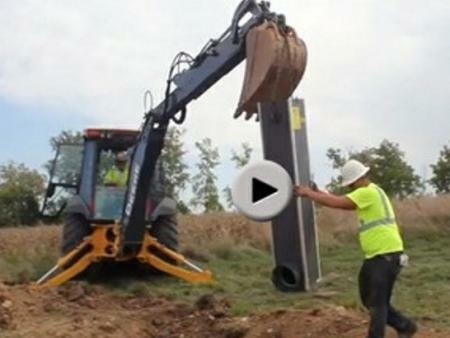 Louis McFarland, field day chairman for OLICA, installed the drainage system at the Farm Science Review site. He said the system, one of which is typically installed for every two feet of elevation on a farm, can be especially beneficial to farmers during a drought. “Store that water that used to go out of the tile, so especially in a year like this when it is an exceptionally dry year, the crops have the ability to use that as a reserve to increase their production,” he said. “We’re not damming the water completely up. But, Sullivan cautions, the system doesn’t work in every field. It works only on relatively flat land, not fields that have sloping grounds.